​﻿﻿﻿Enjoy a creative evening with friends. With the step-by-step guidance of instructor Jenny Turner, you will recreate a featured painting and be able to take it home with you when you leave. ​Jenny Turner is the founder of Art Party by TurnerArts, which is located in the Thumb of Michigan. 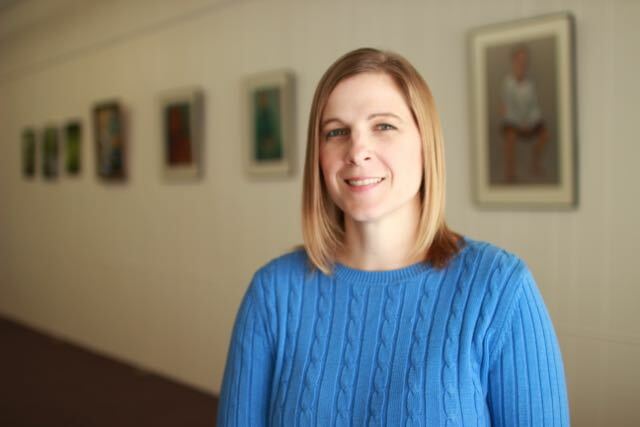 She has an Art Degree from Spring Arbor College, and has taught Art Education locally. Over 4 years ago Jenny started teaching Michigan residents at Art Party by TurnerArts. In 2016 she opened the TurnerArts Studio and Gallery where she holds painting parties and also various classes in the arts. Her method for teaching puts others at ease, and keeps people coming back to learn more. Host a Private Party with your friends, family, or coworkers; in your home, business, or church. Fill out the "Request A Party" form and we will contact you to book your party and work out the details. These events are open to the public and happen at our studio, local restaurants and public spaces. Visit the Upcoming event page to register. Q: WHAT KIND OF EVENTS DO ART PARTY BY TURNERARTS OFFER? 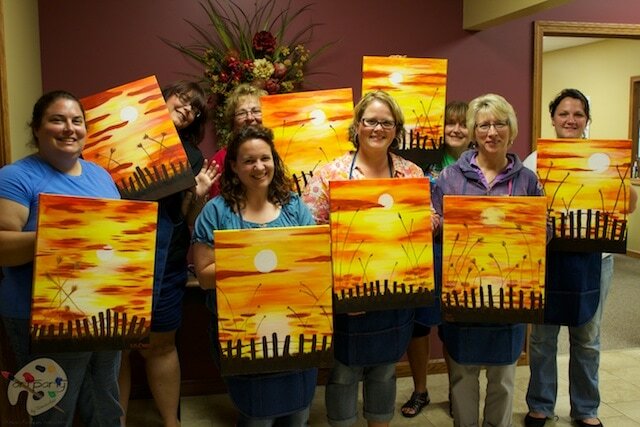 A: Art party offers, fun and creative painting parties for adults and children. Great idea for birthday parties, couples night, a girl’s night out, corporate and team building, or just to get together with friends. Parties last around 2-3 hours. Open Art Party by TurnerArts events take place at our TurnerArts Studio & Gallery (19 S. Main St. Pigeon) or local restaurants and venues. Check out the Classes & Events tab for upcoming events. Q: DO I NEED TO HAVE HAD ANY PRIOR ART CLASSES OR ART EXPERIENCE TO ATTEND AN ART PARTY EVENT? ﻿A:﻿ Absolutely not! This type of experience is designed for the beginner, but allows more skilled artists the freedom to add their own personal touches as well. Everyone who comes will leave with a beautiful painting, they have created. EVERYONE is an Artist! 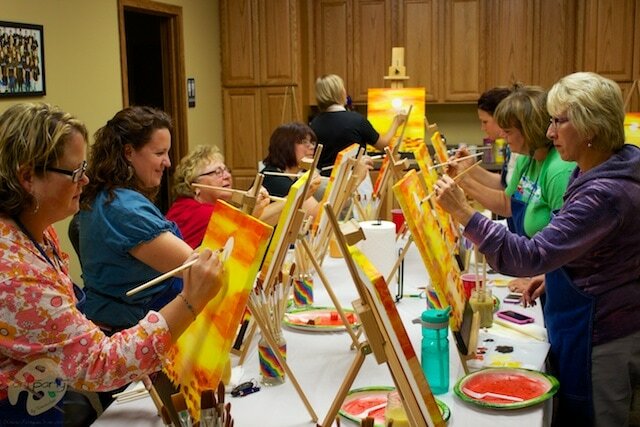 ​Q: HOW MANY PEOPLE DO I NEED TO HOST AN ART PARTY? A: Parties must have a minimum of 6 and a maximum of 30 painters. If less than 6 people attend the party, the host will be responsible to cover the cost. 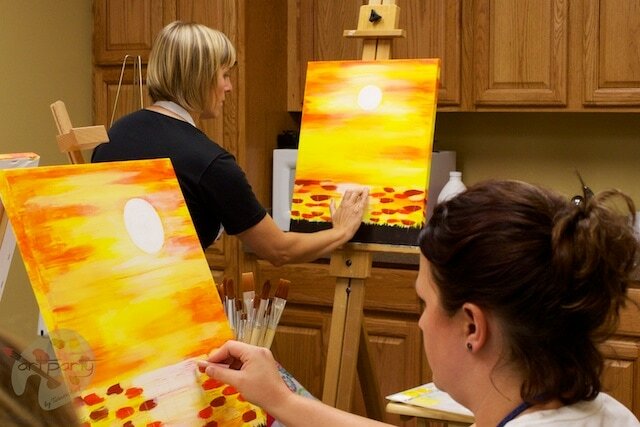 ​Q: HOW CAN I HOST AN ART PARTY? A: Use the contact form on this site and someone will be in touch to schedule your party. The host gets a discounted price and gets to choose the painting they would like everyone to paint for the party. Q: WHAT IS THE COST OF AN ART PARTY EVENT? A: The cost to host a party is $30 to reserve your date. If you provide the location for your party (home, church, restaurant, etc…) this fee is refundable as long as the date is not cancelled or changed to another month. If you choose to have it at the TurnerArts Studio & Gallery (19 S. Main, Pigeon), the $30 reserves the building and is nonrefundable. The date will not be held until payment is made. The cost is $30 per painter and the host pays $15 if there are 6-15 people in attendance and is free with 16-30 painters. ​Q: HOW FAR WILL TURNERARTS TRAVEL TO PUT ON AN ART PARTY? A: TurnerArts is located out of Pigeon Michigan, and will travel about one hour from there. Q: IF I HAVE ATTENDED OR HOSTED AN ART PARTY IN THE PAST, CAN I COME OR HOST AGAIN? A: Yes! Come as often as you like or host as many times as you like. Just check to make sure a different painting is being created that night. A: We provide aprons, but you may want to wear something you wouldn’t mind getting paint on, just in case. ​Q: WHAT CAN I EXPECT AS A HOST OF AN ART PARTY? A: You can host a party in your home or any venue that can accommodate 6-30 people. One or more tables and chairs in the same room, with good lighting, will be needed to set up the painting area. The instructor will bring table cloths to cover any tables. Food and drinks are highly recommended to make the experience even more enjoyable. The instructor will arrive about 45 minutes to one hour before the party to set up and will clean up after the event. ( All tables, chairs, and supplies, with the exception of food, will be provided if hosting a party at the TunerArts Studio & Gallery). ​Q: IS ART PARTY AVAILABLE FOR KIDS? A: Children's parties are $20 per child, (host child is free) with a minimum of 5 painters. There is a $30 nonrefundable deposit to reserve the date. Recommended ages for kid's parties are 6-17 years old. Canvas sizes are 11x14 or 12x12. An Art Party for kids is around 2.5 hours. Please contact Art Party for more information and birthday party options at the TurnerArts Studio & Gallery in Pigeon.